Some voices linger like echoes in the chambers of the church. We hear them again and again, sometimes with greater clarity than we heard at first. The voice of Loren Mead continues to echo among us who care about the mission of congregations and seek to be people of faith in the world. 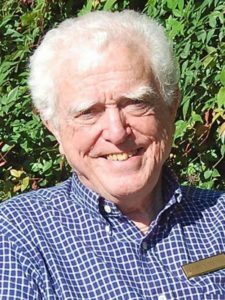 This week, as I learned of the passing of Loren Mead, founder in 1974 of the Alban Institute, I heard his distinctive Southern voice as I heard it in conversations, at conferences, and at the few workshops I co-led with him. What was most distinctive about Loren Mead was what he had to say—in the 1990s when few were saying it—and what he still has to say to us now. When I work with a congregation, my client is two congregations—one is that one there that I’ve got to work with; I’ve got to keep them working and feeling like they’re getting toward what they need. But the other client is that congregation as God is calling it to be. We all know too clearly the congregation that is “there that I’ve got to work with.” We also have glimmers of that congregation’s aspirations, and sometimes we even get an inkling of “that congregation as God is calling it to be.” Sometimes that creative tension pushes congregations to imagine and push into the future. At other times, the tension feels insurmountable, like a chasm neither faith nor skill can find a way to cross. Though he believed and wrote that “The real church is the local church,” Mead also spoke of the church more globally, and especially of the shifts in the relationship of Christianity to culture. In Once and Future Church, Mead described three “paradigms” or “ages” of the church: the Apostolic Paradigm of the persecuted early church, the Christendom Paradigm of the institutional church embedded in the Roman Empire after Constantine. The church of postwar America was in some ways even more allied with the culture. But with the loss of “cultural establishment,” the church often finds ourselves today surrounded by benign indifference. Mead pointed toward a “third way of being church” he hoped would emerge in response to the new environment. I was formed early on my church consulting career by the work of Loren Mead. His work offered me perspectives and practices for engaging the creative tension between the church that was and the church that possibly might be. I am grateful for his life and his work. We don’t know what kind of future God has in mind—or in store—for the church. But the church can only benefit from having had Loren Mead’s clear-eyed appraisal of what once worked and his challenge to see what might work now and in the future.